Do you think your country should keep the Euro as the currency or return to the original currency? 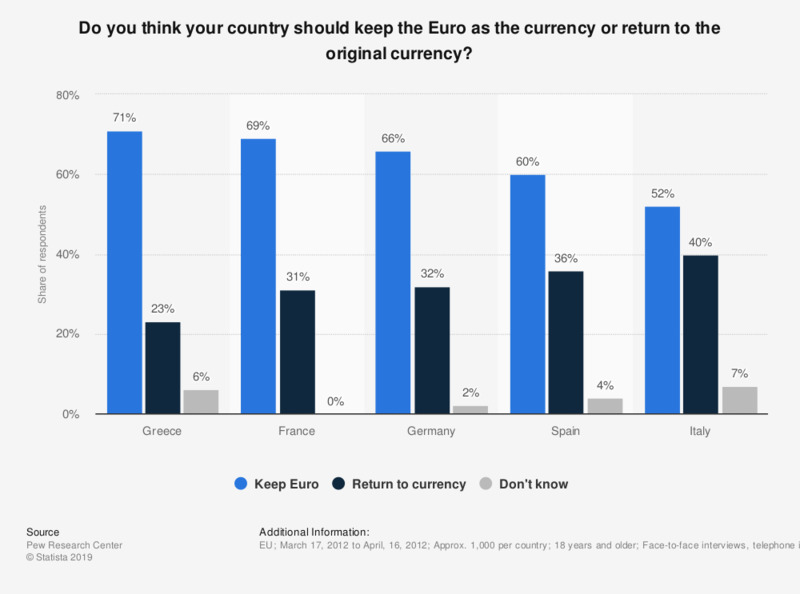 This statistic shows public views across various European countries as to whether they would be better off keeping the Euro or returning to their original currencies. 71 percent of respondents in Greece held the view that it was best to keep the Euro. In France respondents were asked if they should return to the franc, in Germany the marc, in Spain the peseta, in Italy the lira and in Greece the drachma. Do you agree that most people are better off in a free market economy, even though some people are rich and some are poor? Do you favor or oppose giving the European Union more authority over the national budgets of member countries, even if it creates more limits on the powers of your country's government? Will the next twelve months be better, worse or the same, when it comes to the economic situation in the EU? Thinking ahead over the next 12 months do you expect your own financial situation to get worse, stay the same or get better?